In a motor vehicle, the term powertrain or powerplant describes the main components that generate power and deliver it to the road surface, water, or air. This includes the engine, transmission, drive shafts, differentials, and the final drive (drive wheels, continuous track as in military tanks or caterpillar tractors, propeller, etc.). 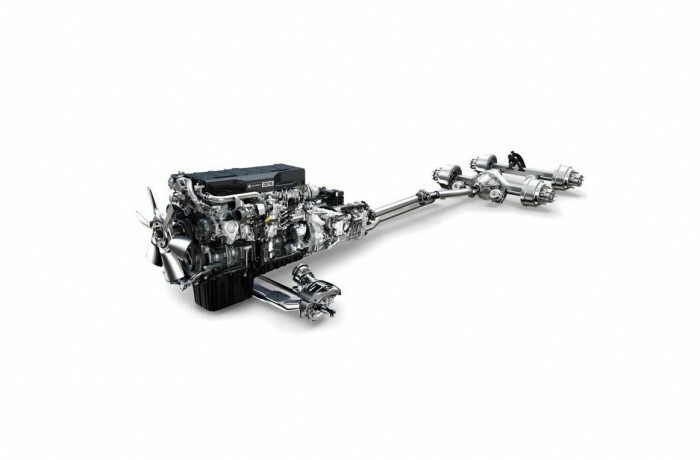 Sometimes "powertrain" is used to refer to simply the engine and transmission, including the other components only if they are integral to the transmission. In a carriage or wagon, running gear designates the wheels and axles in distinction from the body. A motor vehicle's driveline or drivetrain consists of the parts of the powertrain excluding the engine and transmission. It is the portion of a vehicle, after the transmission, that changes depending on whether a vehicle is front-wheel, rear-wheel, or four-wheel drive, or less-common six-wheel or eight-wheel drive. In a wider sense, the power-train includes all of its components used to transform stored (chemical, solar, nuclear, kinetic, potential, etc.) energy into kinetic energy for propulsion purposes. This includes the utilization of multiple power sources and non–wheel-based vehicles.